University President Drew G. Faust, pictured in Feb. 2018, has formed a committee that will examine the recent forcible arrest of a black student. 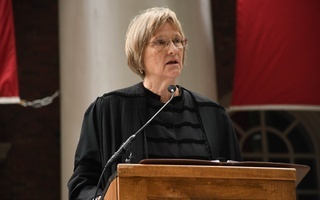 UPDATED: April 30, 2018 at 5:15 p.m.
University President Drew G. Faust has formed a “review committee” to determine the exact “sequence of events” leading to the forcible arrest of a black undergraduate April 13 and to undertake a “systematic examination” of a wide variety of Harvard policies. “The committee will start by determining the sequence of events leading to the student’s events,” Faust wrote in an email to students Monday. The results of that determination will then "inform a more systematic examination of opportunities for improvement across a range of institutional activities," Faust wrote. “This work must start with a focus on how the changing nature of our student body should influence the ways in which we address issues of College policy, mental health resources, and community policing," she added. Harvard Law School and History professor Annette Gordon-Reed will chair the committee, according to Faust’s email. The group will include six other individuals including professors at the Business School, Kennedy School, Graduate School of Education, and Medical School, as well as a House faculty dean. Faust wrote the committee’s work must “proceed with a special urgency” and that she has discussed the committee with President-elect Lawrence S. Bacow. Bacow will take Harvard’s top job after Faust steps down from the presidency in June 2018. “In consultation with President-elect Bacow, I have asked the committee to work intensively during the remaining weeks of the semester, to complete its work over the summer, and to make findings and initial recommendations in time for action before the start of the fall semester,” Faust wrote. Harvard spokesperson Melodie L. Jackson wrote in an emailed statement Monday that the committee's findings will be made public. 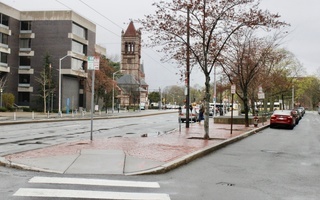 The forcible arrest took place roughly two weeks ago when three Cambridge Police Department officers and one Transit Police Department officer responded to calls about a naked man standing on Massachusetts Ave. around 9:09 p.m. April 13, the night of the College’s annual spring concert. 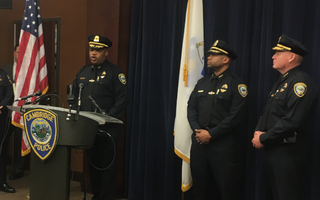 In the physical altercation that followed, officers tackled the student to the ground before arresting the undergraduate—who was likely under the influence of narcotics—on charges including indecent exposure, disorderly conduct, assault, and resisting arrest. A video of the incident later published by CPD shows the student standing still, surrounded by four officers, while the officers talk to him for at least several seconds. The student turns around and takes two steps towards one officer before taking a step back and raising his arms to chest-level. Another officer then tackles the student from behind. 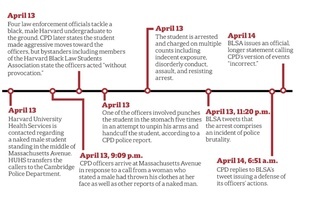 While the student remained on the ground, at least one CPD officer punched the undergraduate in the stomach five times in an “ineffective” attempt to unpin the student’s arms and handcuff him, according to the CPD police report. BLSA has called the incident an instance of police brutality, and Cambridge Mayor Marc C. McGovern and Faust later called the incident “disturbing.” Harvard Law professors Ronald S. Sullivan Jr. and Dehlia Umunna, who lead the Harvard Criminal Justice Institute, are now legally representing the student. The arrest has roiled campus, generated national headlines, and drawn protest from Harvard students. In the days following the incident, a group of undergraduates formed a new advocacy group called Black Students Organizing for Change whose mission is to “hold Harvard University accountable for the safety of community members, particularly Black and Brown students,” as BSOC members wrote in an open letter to Harvard last week. More than 300 University affiliates and 22 student groups had signed that letter—which demanded reform to certain Harvard structures and policies some say facilitated the April 13 arrest—as of Sunday morning. The letter criticized Harvard’s initial response to the April 13 incident and called on the University to provide financial and academic support for the student and to publish a report detailing the events leading up to the undergraduate’s tackling and forcible arrest. The letter also demanded Harvard designate all drug and alcohol-related calls to Harvard University Health Services as medical emergencies, acquire a University-owned ambulance, and expedite hiring of “Black and Brown counselors” at Harvard Counseling and Mental Health Services. The letter requested that Harvard agree via written statement by May 1 to implement BSOC’s demands. Faust’s email—though it does not directly address all requests listed in the letter—meets that deadline. "If our faculty, students, and staff do not feel safe and supported, if they do not feel that the institution is committed to creating the conditions where they can succeed, then we must do better and we must act," Faust wrote. "It is clear, in light of the recent incident and the ensuing conversations, that there is work for us to do." 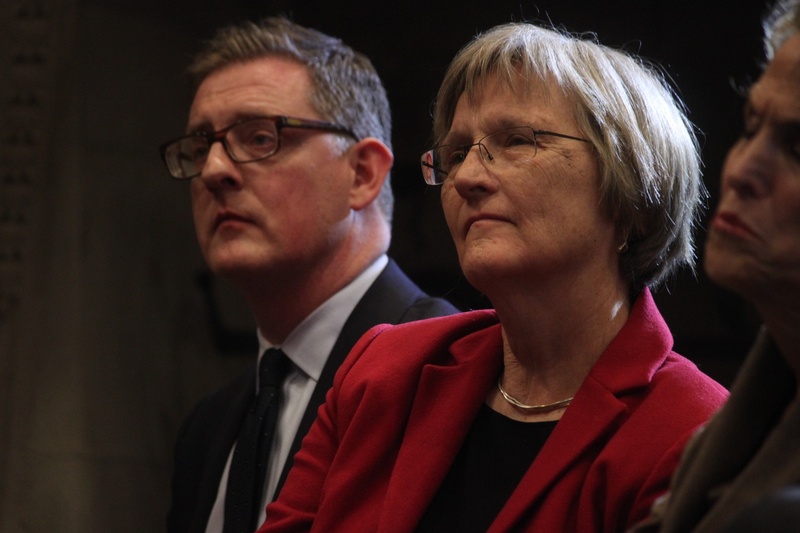 Members of BSOC declined to comment on Faust's announcement of the review committee. But several students affiliated with the group sent emails over internal Harvard House and student group server lists Monday urging undergraduates to support the demands BSOC listed in its open letter. The BSOC emails suggested students email members of the review committee as well as various administrators. "We're putting pressure on this committee and on some key administrators to o more than learn from it [the arrest[," one BSOC email reads. "We want Harvard administrators to take action and follow through on BSOC's concrete demands." The email indicates HSOC hopes to ultimately convince at least 200 students to send four emails each to Faust, Dean of the College Rakesh Khurana, review committee chair Gordon-Reed, and the review committee as a whole to "remind administrators that our concerns demand their immediate attention." She wrote she has asked the committee to “ensure broad levels of student engagement” during this process and she encouraged students to share their thoughts with the committee via email by sending a message to reviewcommittee@harvard.edu. Faust Creates Committee to ‘Review’ Arrest of Black Student, "